The Quality Management System standard ISO 9001:2008 is was revised and the revised standard ISO 9001:2015 was released in September 2015. Accordingly, all the certified companies had to update their existing ISO 9001:2008 system to the revised standard within three years, i.e. before September 2018. The ISO 9001:2015 standard was released to meet the new challenges faced by businesses and organizations in the wake of globalization. For better understanding of QMS as per 9001:2015, we are providing ready-to-use ISO 9001:2015 awareness training presentation kit. Many organizations and individuals have taken part in our QMS training programs, which we have delivered using this QMS Presentation kit. This ISO 9001:2015 training presentation kit for QMS 9001 awareness gives relevant information about Quality Management System's requirements and documented information as well as steps for ISO 9001:2015 certification. Quality Management System - ISO 9001:2015 Awareness Training Presentation as per revised ISO 9001:2015 is prepared by a team of highly-qualified management professionals. 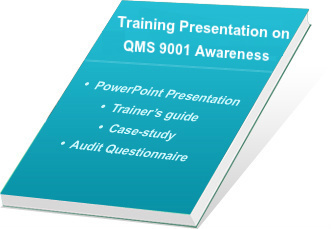 This QMS awareness training presentation slides are very useful while conducting corporate training within the organization or any work area. We have used it to conduct awareness training programs on ISO 9001:2015 for our clients and this kit has helped them in successful implementation of quality management system within their organizations. Sample filled risk assessment templates. This part includes write-up in word for the ready-reference to the participant and for better understanding and reading. A sample filled risk template and sample ISO 9001-2015 awareness training certificate are also given. Handouts are written in MS Word document 2007 and Presentation is made in Powerpoint. Developed under the guidance of experienced QMS trainers and consultants. On successful completion of payment process, we provide username and password to download the product from our FTP server. Delivery of our products will be given within 12 hours of payment confirmation by secure third-party payment gateway.